Reading is a fundamental life skill that’s essential to future success. If you can read this right now, it’s because you had teachers, parents, and others who read to you when you were young and who taught you in school. Now, through a new program by the Board of Education, you can help make a difference in the reading abilities of Dodge County students from the comfort of your home or office. Simply make a recording, using your phone, of yourself reading a children’s book. Then send the video to Mariella Douglas, Director of Curriculum and Professional Learning for Dodge County Schools. It’s important that students see their teachers, administrators, and others they recognize as examples of readers. Reading aloud to students helps increase their reading ability because it models fluent reading and speaking. By following along and seeing how the reader emphasizes different words, pauses at commas and periods, and pronounces difficult words, students can increase their own reading fluency as well as learn new words. 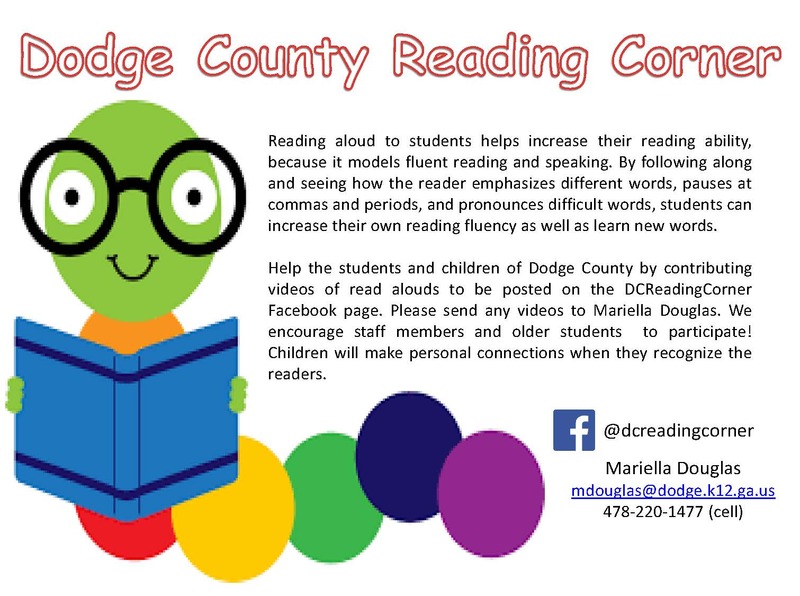 Help the students and children of Dodge County by contributing videos of read aloud to be posted on the DCReadingCorner Facebook page. Please send any videos to Mariella Douglas. We encourage staff members and older students to participate! Children will make personal connections when they recognize readers. Next Food Boxes | Donate Today!